As most of the world ignores or hypocritically celebrates the 147th birthday of Mohandas Karamchand Gandhi on the International Day of Nonviolence on 2 October, some of us will quietly acknowledge his life by continuing to build the world that he envisioned. 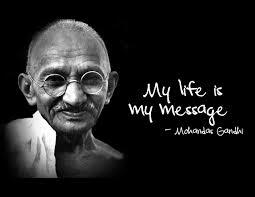 When asked for his message for the world, Gandhi responded with the now famous line ‘My life is my message’ reflecting his lifelong struggle against violence. Gandhi’s life was dotted with many memorable quotes but one that is less well known is this: ‘You may never know what results come of your actions but if you do nothing there will be no results’. Fortunately, there are many committed people who have identified the importance of taking action to end the violence in our world – whether it occurs in the home or on the street, in wars, as a result of economic exploitation or ecological destruction – and this includes the courageous people below. These people have identified themselves as part of the worldwide network, now with participants in 96 countries, committed to ending violence in all of its forms. I would like to share their inspirational stories and invite you to join them. Christophe Nyambatsi Mutaka is the key figure at the Groupe Martin Luther King http://preventgbvafrica.org/member/groupe-martin-luther-king-asbl/ which promotes active nonviolence, human rights and peace. The group is based in Goma in the eastern Democratic Republic of the Congo (DRC) in central Africa. They particularly work on reducing sexual and other violence against women. Also based in Goma, the Association de Jeunes Visionnaires pour le Développement du Congo http://www.ajvdc.org/ headed by Leon Simweragi is a youth peace group that works to rehabilitate child soldiers as well as offer meaningful opportunities for the sustainable involvement of young people in matters that affect their lives and those of their community. Given the phenomenal suffering in the DRC, which has experienced the loss of six million lives and the displacement of eight million people due to the long war driven by Western corporations keen to exploit the country’s mineral wealth, Christophe, Leon and their colleagues are testimony to the fact that committed people strive in the most adverse of circumstances. Tess Burrows in the UK is an adventurer (including parachutist, mountaineer, cyclist and marathon runner), peace activist, author, speaker, healer, and ‘most importantly a mother and grandmother’. In her words: ‘I am dedicated to the pursuit of World Peace and the healing of the Earth.’ Tess has written several books and, if you are looking for inspiration, I suggest you try these: ‘Cry from the Highest Mountain’ (describing a climb to the point furthest from the centre of the Earth), ‘Cold Hands, Warm Heart’ (describing a trek across the coldest, driest, windiest place on Earth: the Geographic South Pole), ‘Touch the Sky’ (describing her climb of Mt Kilimanjaro, in Africa’s heartland, pulling a car tyre which included peace messages from every nation on Earth and embodying their desire for everyone to pull together to promote peace) and her latest book ‘Soft Courage’. Her video ‘Climb For Tibet’ https://vimeo.com/10670069 won’t bore you either! The funds raised from sales of the books and donations have, among other things, built six schools in Tibet and supported a Maasai community tree-planting project in Africa. Tess collects messages of peace from individuals and speaks them out from ‘far high places’. So far, this has included the North and South Poles, the Himalayas, Andes, Pacific and Africa. You can be part of her next Peace Climb in Australasia by writing your personal message on her website http://tessburrows.org/ where you can also check out her books. Be warned however, this website will exhaust you! Kristin Christman in the USA continues her tireless efforts to make our world more peaceful by seeking to understand the deeper drivers of conflict while offering practical steps forward. She is currently working on a book based on her monumental ‘Taxonomy of Peace: A Comprehensive Classification of the Roots and Escalators of Violence and 650 Solutions for Peace’ https://sites.google.com/site/paradigmforpeace/ A recent rather personal article offers insight into her approach: ‘Make serving in war an option, not an order’ http://dissidentvoice.org/2016/05/make-serving-in-war-an-option-not-an-order/ and illustrates how violence is ‘built-into’ society. So what about you? Do you believe that ending human violence is possible? Even if you believe that it is not, do you believe that it is worth trying? As Gandhi noted: ‘The future depends on what we do in the present.’ What will you do? And if you subscribe to Gandhi’s belief that ‘Earth provides enough to satisfy every [person’s] needs, but not every [person’s] greed’, then you might consider participating in ‘The Flame Tree Project to Save Life on Earth’ http://tinyurl.com/flametree which he inspired as well. Each of us has a choice. We can stand aside in the great fight for survival in which humanity is now engaged. Or we can be involved. What is your choice? The bottom line is this: What will be the message of your life? This article originally appeared on Transcend Media Service (TMS) on 3 Oct 2016. Anticopyright: Editorials and articles originated on TMS may be freely reprinted, disseminated, translated and used as background material, provided an acknowledgement and link to the source, TMS: Gandhi: ‘My Life Is My Message’, is included. Thank you. Although he may not have always practised what he preached, maybe we should remember too the songs/words of John Lennon. In particular “Imagine all the people sharing all the world” seems to hit the mark in this world where millions of refugees, torn from their countries, are struggling to find a place they can call home.